One month into the casitas… is it working? I asked Maria if I could come visit her on Saturday. “You’ll have to ask my mommy Zoila,” she said. 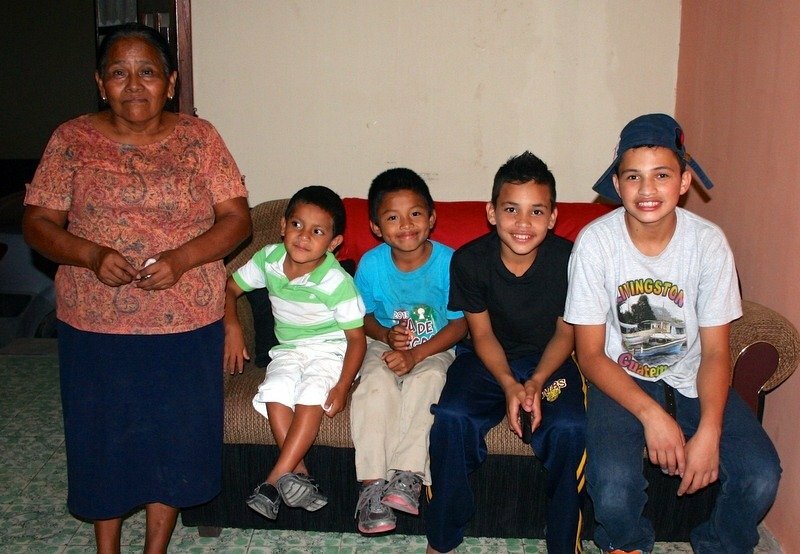 Zoila is five-year-old Maria’s foster mother, an incredible woman who has committed to raising five children – children who are not her biological family – as her own. Maria’s new “casita” is a bright pink house with three bedrooms, a spacious but cozy living area, and a nice big porch where she and her new family relax on hot afternoons. Maria lives with her biological brother and three other children. When I visit, she takes my hand and shows me to her new bedroom that she shares with two other girls, proudly displaying the cluster of stuffed animals perched around her pillow. “This is my room,” she says, smiling widely. When we first started planning for the Casitas, many people told me that we’d never be able to find our Casita moms, the most important factor in the success of this project. While I admit I am a tireless worrier and spent many a sleepless night stressing out about the casitas, I never doubted that we’d find our moms. Ever since I started Casita Copan in 2012, I have been amazed by the amount of love that people can feel and share with children who are not their own. I’ve started to think that it’s not as hard as we pretend it is, that we all have the capacity to care for others a whole lot more than we say we can. The casitas have been open for one month now and I still get that warm fuzzy feeling when I walk past them on my way home. I know that inside, a handful of children that used to live in an orphanage are now sprawled on the couch watching cartoons, finishing their homework, teasing each other, playing soccer in the backyard, helping with the chores (or more likely complaining about their chores), sharing a meal, or just hanging out like a regular family. Each group of 4 or 5 children that live in a casita now have a loving caregiver to call “mom” and a real place to call home. I get asked a lot why I chose this model of the “casitas” or family-style care. Wouldn’t it be cheaper to house all the children together? Wouldn’t it be safer? How can you make sure that nothing happens to any of the children? Couldn’t you help more kids if you kept them all together? I understand the safety issue. It was my biggest concern when researching other family-style care facilities and putting together a model that could meet the needs of our children and fit the realities of Copan Ruinas. We designed a model where we would be in constant contact with our staff and children to keep them as safe as possible. But I also know that you can never keep children completely safe. Ask any parent. Ask any teacher, police officer, doctor. Safety should not be a reason to keep children locked up inside an institution. That may reduce liability, but it isn’t safer. Research shows that the biggest dangers for children in institutional care are right there inside the institution. Lack of interaction with the community – with real life – can dramatically impact a child’s ability to function as an adult. I also know that money has to be a factor when talking about development and nonprofit programming. We always have to be thinking about how best to impact our community with limited resources. But I believe that we have to make sure that we are not just maintaining the status quo, but constantly looking for better ways to address our community’s problems. It’s true that I could provide shelter and food to more children if Casita Copan operated as a traditional institutional orphanage. But we know that shelter and food are not enough. Children need so much more than just a roof over their heads. When our donors pledge their support, they are making an investment in the lives of the children that live in the casitas. When a child grows up in a healthier environment that is more like a real family, his or her chances for success in the future are much higher. So yes, the cost is a bit more (although not that much more), but it is definitely worth the investment. One month in… have there been challenges? A day never passes at Casita Copan without a challenge. Have there been successes? Absolutely and I know that more are yet to come. And I can’t wait to share these challenges and successes with you. On a more personal note, I was so humbled by the outpouring of support, demonstrated both through financial donations and kind words, that we received as we launched this project. Our supporters are truly a committed bunch and prove that together we really can make the world better. Thank you all. Stay tuned for more updates!